In October 3rd 2016, in Ho Chi Minh City, the Ministry of Labour - Invalids and Social Affairs in collaboration with the Center for Rehabilitation and assistance to disabled children in the city and non-Government Organization called Kinderhilfe Hivong Vietnam EV (CHLBD) hold the workshop "The result of 40 years of cooperation between the Ministry of Labour - Invalids and Social Affairs and Kinderhilfe Hyvong Vietnam EV’’. Deputy Minister Nguyen Trong Dam attended and chaired the workshop. Speaking at the conference, Deputy Minister of Labour - Invalids and Social Affairs Nguyen Trong Dam highly appropriated of the results of the cooperation between Kinderhilfe organisation and the Ministry of Labour - Invalids and Social Affairs, specially the Rehabilitation Centre and caring for young disabled people in Ho Chi Minh city for their support and assistance to thousands of children in difficult circumstances in the provinces to rise up and integrate into the community. Deputy Minister Nguyen Trong Dam also said that In the past 40 years, Kinderhilfe Organisation is one of the non-governmental partners which have the most long-term cooperation and the most frequent of the Ministry of Labour - Invalids and Social Affairs through programs / projects of humanitarian, charity,… These programs contributed to improve living conditions for orphans, homeless children, children with disabilities and children of poor and vulnerable people in society, contributing greatly in the protection and care of children, poverty alleviation glom, support people with disabilities in the country. Kinderhilfe Organisation’s aims and objectives are always consistent with the priorities of the Ministry and Vietnam. They also concern about education and training to young people about health care for children with disabilities, poor women with particularly difficult circumstances, poor people in remote areas, building infrastructure, school systems, health care ... The organization has accompanied children with difficult circumstances to bring joy and life to them. Besides, Kinderhilfe Hyvong also contributed a lot to the Ministry of Labour - Invalids and Social Affairs in developing and advising the Government issued policies to protect and care for children. At the same time, developing and training staff working in children caring become more professional gradually. Also, Kinderhilfe also assisted many provinces in the country of funding the construction of schools and bridges, funding scholarships and helping disadvantaged children to continue their study. 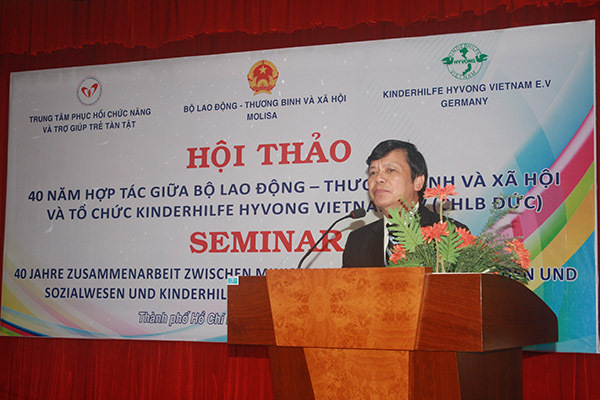 Deputy Minister Nguyen Trong Dam expressed sincere thanks to leaders and staff of the Kinderhilfe Organization for accompanying children in Vietnam for the past 40 years the interest and desire to have this Non-governmental organization support for children in the future. He said that MOLISA would continue to coordinate with local authorities throughout the country to create the conditions for Kinderhilfe implementation of programs and projects to help children with particularly difficult situation in the country. At the seminar, Ms. Le Thi Kim Dung - Director of Department of International Cooperation, Ministry of Labour - Invalids and Social Affairs has reported the results of 40 years of cooperation between the Ministry of Labour - Invalids and Social Affairs and held Kinderhilfe Hyvong Vietnam EV. Accordingly, the Helping children Organization in Vietnam - Hyvong (Kinderhilfe Hyvong Vietnam called Kinderhilfe) is a non-governmental, non-profit organisation established in autumn 1976, with headquartered in Berlin, Germany. So far, Kinderhilfe is one of the organizations to help Vietnam with the long-term operation in Germany. The director of the organization now is Ingrind Sperling, she is also co-founder of the Organization and actively engaged with Vietnam for the longest time. Since the Vietnam War, the founding members of this organization have been helping children who were victims of war and those with particularly difficult circumstances in Vietnam. Activities of the organization initially focused on mobilizing donations and sending wheelchairs to disabled people in Vietnam. Then, they expanded to donate medicines, clothing, fabrics, automobiles, building materials and many other things ... which directly supported the construction and operation of social welfare centers, orphans adopted center and groups of people with disabilities, women, children, ethnic minorities in Vietnam. Executive Committee and the members are working completely voluntary and completely entitled to remuneration. The entire expenditure allowances related to the activities of organizations such as: Postage, publishing newsletters, publications, advocacy, phone bills ... were donated by members, so 100 % of donations were delivered to children in especially difficult circumstances in Vietnam. Through 40 years of continuous cooperation in Vietnam, Kinderhilfe organisation has taken care, nurtured, educated over 40.000 orphans, disabled children and children infected with dioxin in Social welfare centre in Bac Kan, Thuy An (Ha Noi), Ha Nam, Kon Tum, Dak Lak, Ben Tre, Ca Mau, Tra Vinh, Kien Giang, An Giang, Thanh Hoa, Ho Chi Minh City. They also supported 3,900 poor but talented girls in Ben Tre; built hundreds of clinics, kindergartens; gave credit for more than 50 poor women from ethnic economic to improve financial conditions of their families; helped women who took on pottery work... In addition, the organization also supported the training of personnel center staff, support staff salaries to care for disabled children, orphans at the center of social protection. On this occasion, Deputy Minister Nguyen Trong Dam also awarded the Certificate of Merit from the Prime Minister to Dr. Nguyen Xuan Thang - Director of Center for Rehabilitation and support of the disabled children in Ho Chi Minh city and awarded the Certificate of Merit of Labor - Invalids and Social Affairs for Mrs Ingrid Sperling (chairman of Kinderhilfe Organization), Ms. Dumchen, Marie - Luise Gisela Klara and Mrs. Rasmus, Petre - Victoria Margarete Martha), Organization Kinderhilfe, because of their achievements and contributions in caring for and protecting children.